From our home to yours, we wish you the happiest of holidays! 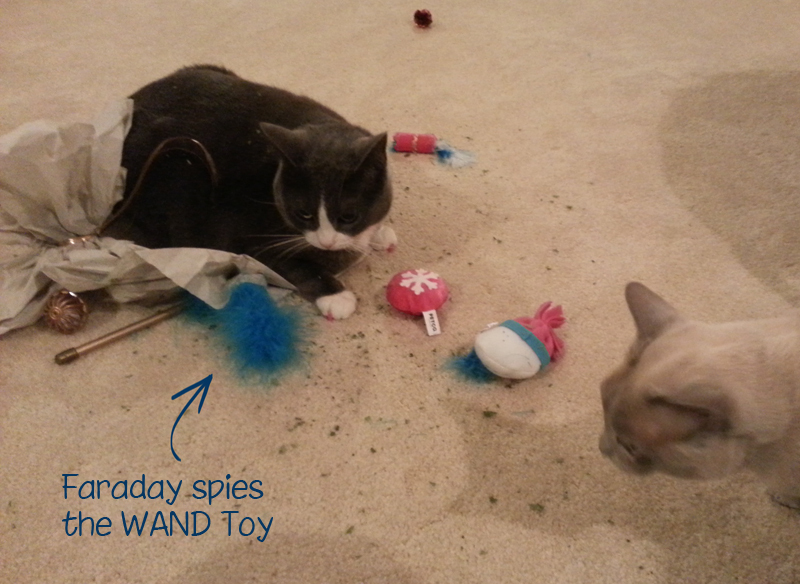 And today, we share in pictures how we kitties spent ours. More menorahs - and dreidels! We kitties got to open our first present on the first night of Chanukah (Dec 8). There was a package for all of us filled with toys and catnip! 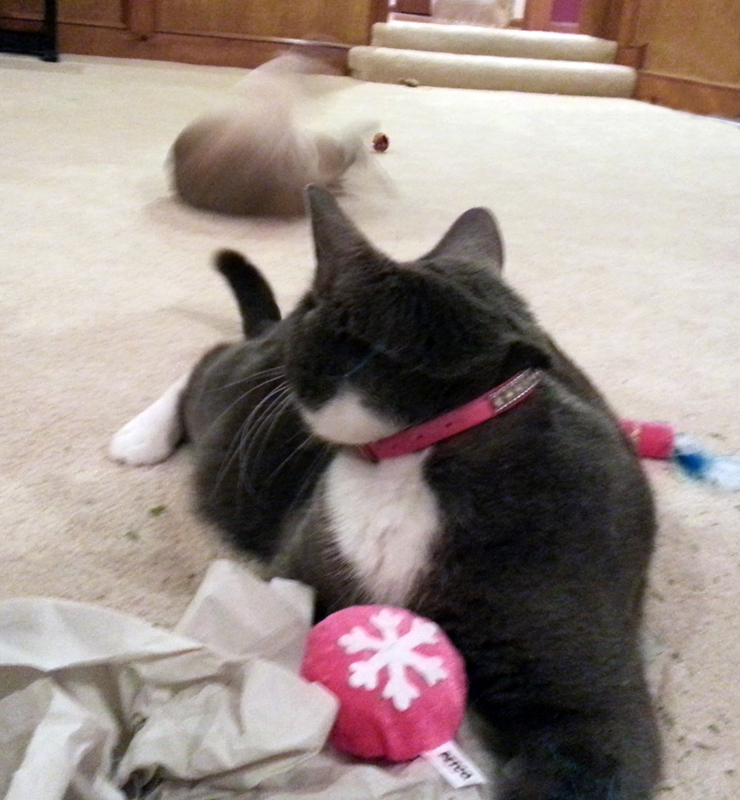 Then someone went crazypants over a crinkle ball. We're not sure but there may have been jazz hands involved. A fun time was had by all, and then we celebrated again on the 8th night. 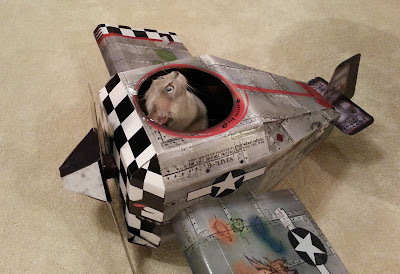 All we can say is that mommy & daddy now aren't the only pilots in the family. After that much excitement, a nap was most definitely in order. We hope your holiday is filled with fun times and lasting memories! 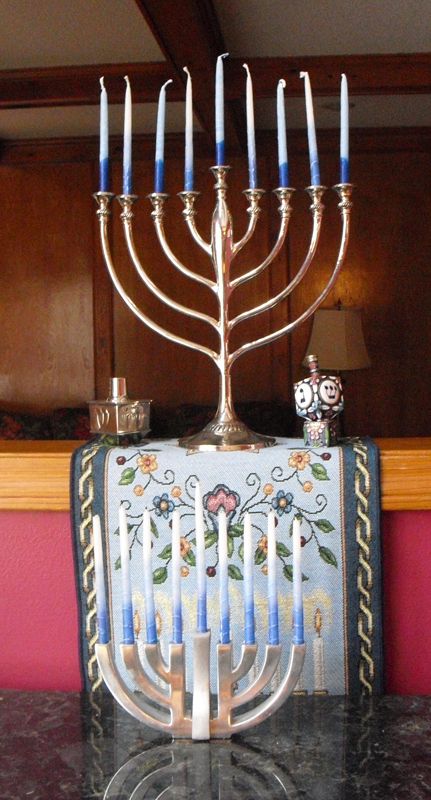 What beautiful Chanukah decorations! And look at all those presents. We especially love your very own airplane! That plane is the coolest! & thank you for your friendship. It has meant alot to us. Your decorations are gorgeous pal It's easy to see you left no detail undone., Wow - and that plane is something else. Even I don't have one of those. Cool buddy, cool! I loved this post...so nice to see how you decorate and a "Junior Birdman" reference too...I'll probably be singing that in my head for the rest of the day BOL! HA, mommy says she loves company! She's been singing that for days! CJ and I wish you all a wonderful Holiday Season! Your decorations look lovely. We like your aeroplane too. I think Faraday really MAKES that mantelpiece arrangement! He looks very calm and non-destructive up there, heh heh. Thanks for posting the pictures--my favorite is "somekitty" gone all crazypants in the background. Maybe Allie would like to fly out for the day since I am being 'bandoned till Wednesday while the Human goes heaven-knows-where to have fun without me. ::pout:: Plus, maybe Allie could bring her pink toys? XOXOXO to all! We think that the lights of Chanukah are so beautiful...we have loved learning more about this special holiday this year. We love your decorations! And that plane is PAWSOME!! Happy Holidays to all of you!! OMD! Where did you get that plane???? 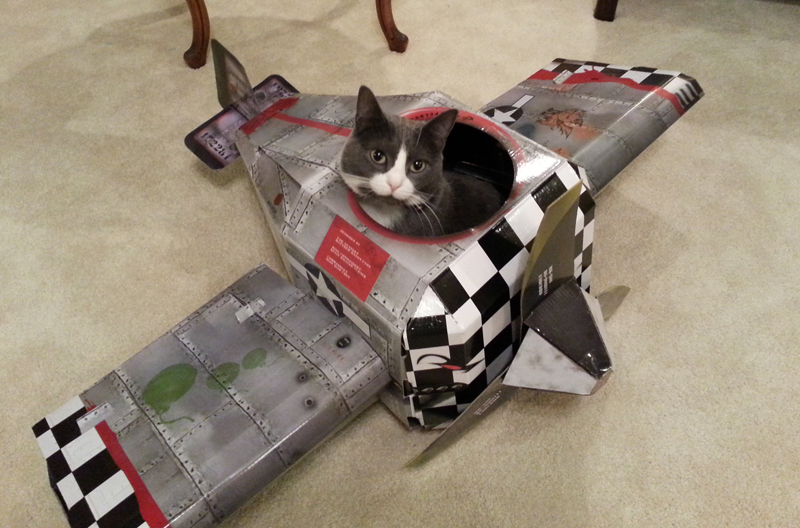 OMC, how awesome that you kitties got your own PLANE! I can see you had a great holiday! 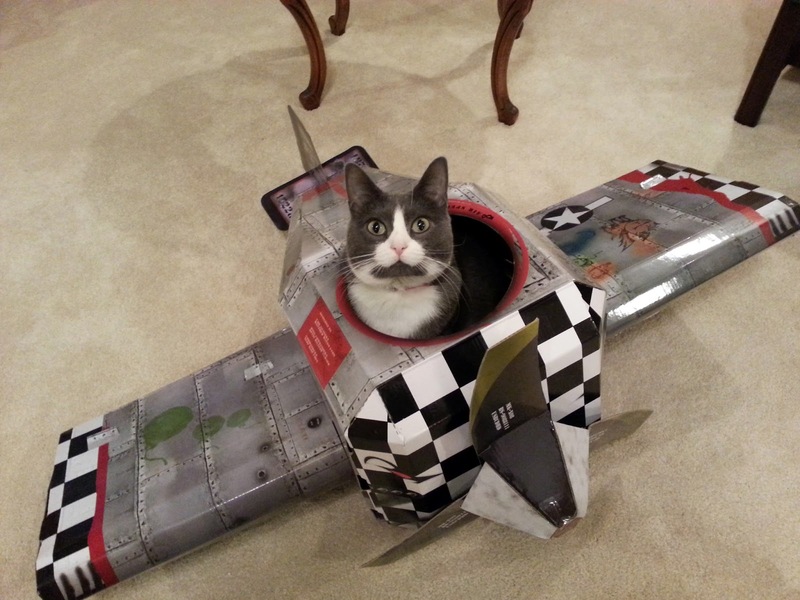 You realize that EVERY kitty in the Blogosphere will HAVE to have a plane now...OMC how cool is that!?!!!! We think your decorations are lovely. We don't get anything because Mommy says we are too destructive. pah! Look at those presents! Allegra and Ruby will never let me hear the end of it until they get one of those planes - it is simply awesome! 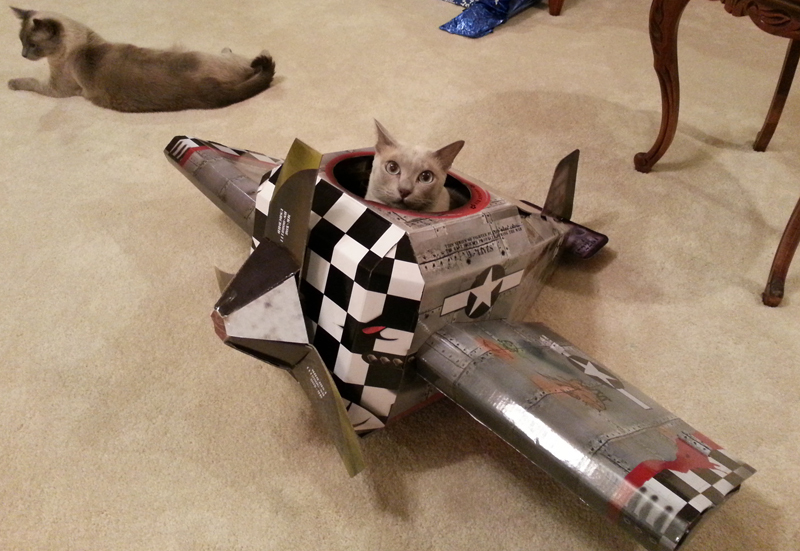 Is that airplane a cat bed???? Meowzers, it looks like you all had a great time! PeeEss the plane is awesome!!! Wow your plane is COOL!! Very cool pictures and post kitties! 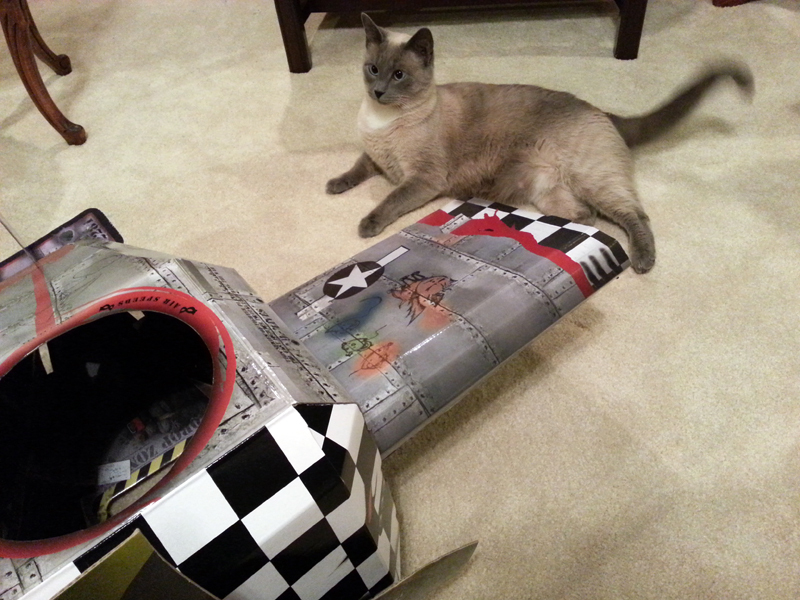 And the bestest of pressies...airplane trumps sled for sure! Psst...Clooney Claus is here with goodies for you kitties, can you let me in? Meowy Catmas and happy holidays to all! you really go all out for Chanukah! We sure don't! We're awful Jews! lol. Love that airplane! Wow you got your very own airplane! How cool! Glad you guys had a good Chanukah! Thanks for sharing! Whoa! I want an airplane too! Hey Allie, you'll have to take me for a spin. such beautiful decorations. 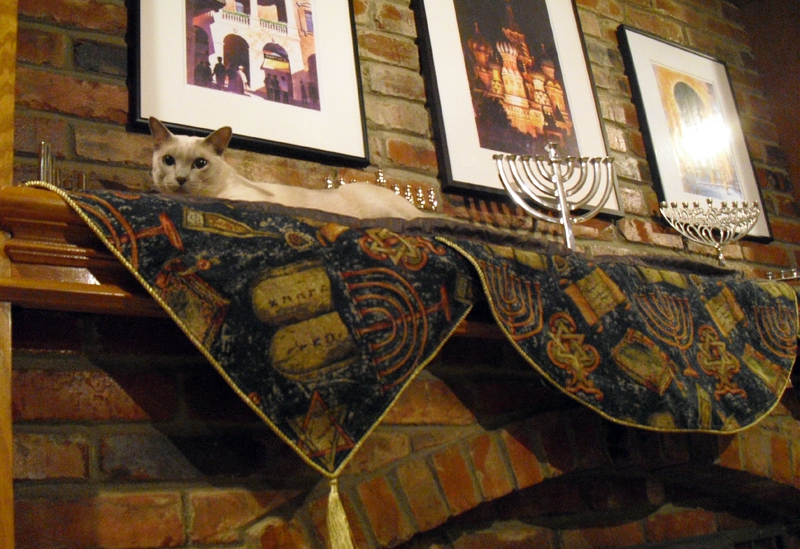 When you said the kitties got presents on day one, I couldn't help but wonder if they got presents each night, and if so if they got horribly spoiled :) But I see you didn't do each night..
Wowee wow wow, the house looks beautiful, the menorahs and dreidels are so pretty and your prezzies look pawesome. Mom asked me to share that she knows that up in the air song from camp!!! 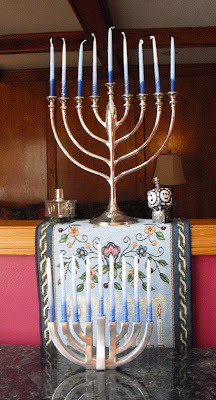 Your menorahs are beautiful. And what lucky kitties you are to get all those great gifts! Big Purrrrrrrrrrrrrrs to all of you.